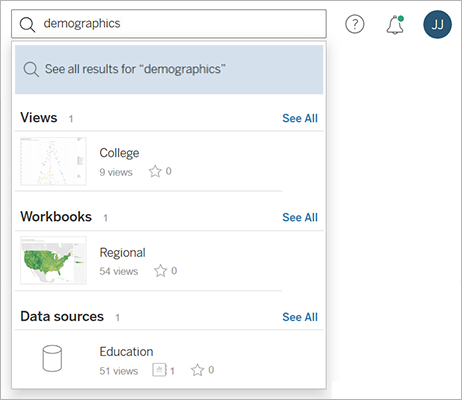 Tags are keywords you can create for workbooks, views, data sources, and flows to help you find, filter, and categorize content in Tableau Server and Tableau Online. 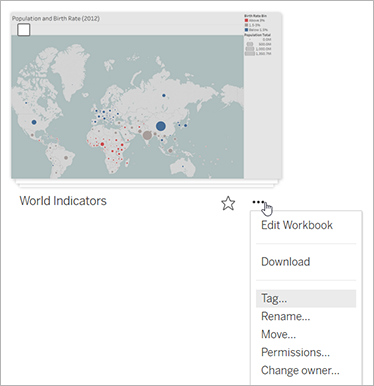 Authors can add tags to content when they publish content to a Tableau server. You can also add tags to any content you are allowed to access, and you can delete any tags you have added. Note: You cannot tag projects. For a published workbook, view, data source, or flow, its tags appear in the tooltip when you hover over the thumbnail. 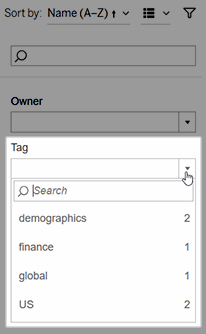 Use tags to find content with quick search. You can add tags to any content on the server that you have permission to access. 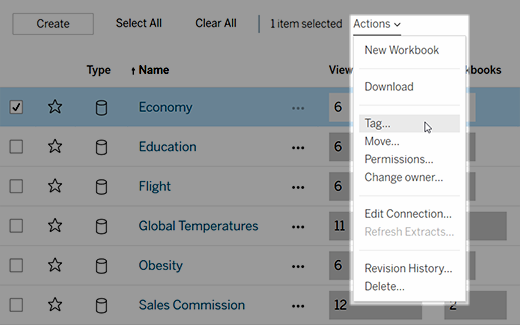 Navigate to a list of workbooks, views, data sources, or flows. Select one or more items you want to tag, and then select Actions > Tag. Enter one or more words in the text box, and then click Save Tags. You can delete any tags that you have created. Click the … to access the drop-down menu on specific content, then select Tag. Click the 'x' next to the tag you want to remove.